With Side-Line about to launch the fifth volume of the publication’s acclaimed Face the Beat compilation series, a free single showcasing the DAC charting dark electro act Sick Man has been made available in support of various charity projects. 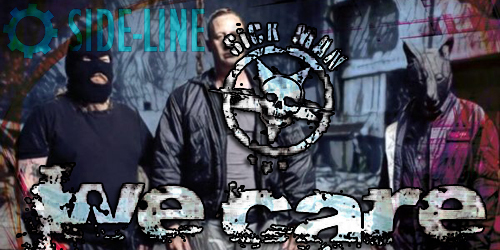 Named after the Funker Vogt single and comprised of band members Sacha Korn (onetime vocalist for Funker Vogt), G.Schade (founding member of Subway to Sally), and Robert Tuta (of Poland’s Agressiva 69), Sick Man’s We Care single includes two remixes of the track “Sick Man,” the original version of which is featured on the Sick Men album that was released in December of 2017, and a Superhuman remix of “The Last Awakening.” All three tracks were originally featured on the Sick Man single released by Funker Vogt in 2014 via Out of Line. We Care marks Side-Line‘s second free single, following 2017’s Too Little Too Late single from Mortiis, in a series to be released over time by bands supporting the publication’s charity projects. We Care is now available as a “pay what you want” item on Bandcamp.